Potential employers won’t hire you without experience, but how do you get experience if they won’t hire you? Find an internship. Not only will you gain skills you can leverage once you graduate, you may turn your internship into a job offer. Assess your strengths: Your friends may be applying to Fortune 500 companies for a summer slot, but that doesn’t mean a big corporation or the experience you’d get there is right for you. Talking to career counselors and doing self-assessment exercises will pay off in the long run. Don’t be afraid to pursue an internship at a small company if it provides the kind of experience you’re interested in. Be creative: You can turn any situation into an internship. Initiative is the key. If, for instance, you have a part-time job, ask to shadow your manager. You can do many things to learn about the culture of the company. Get involved in advertising. Learn about marketing gimmicks. Ask to attend major conferences. Ask questions: Don’t assume anything about an internship, Green says. You need to ask how many hours you’ll work, what your duties will be, if you’ll get academic credit, where you’ll be working and if you’ll get paid. “You’re paying, oftentimes, to be there,” she says. 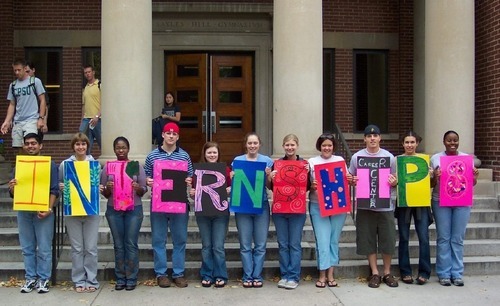 Expect a letdown: Students begin internships with great anticipation. Most of the time, the experience is not what they expected. “Usually internships are a shock to students. People are busy. Sometimes they don’t make time to be with an intern,” Green says. Nothing’s guaranteed: Even if you’re a star employee, you aren’t guaranteed a full-time offer after your internship. That’s particularly true in today’s economy. Companies are paying close attention to expenses and scrutinizing new hires. “So the automatic offer is gone,” Case says. Don’t sweat a mistake: You hope for the best, but your internship doesn’t work out. You don’t like the work or you don’t perform well. In either case, your career isn’t ruined. Internships are a good time to find out if you fit well in a particular industry. If you discover you don’t, consider it a learning experience. “People doing full-time employment are very forgiving of the choice of an internship,” Case says. Mine those contacts: The No. 1 benefit of an internship is the relationships you’ll make with seasoned professionals. That network can last throughout your career, but you have to work on it. Green suggests writing thank-you notes to your supervisors, sending holiday cards and keeping contacts updated on your whereabouts. “You have to follow up because you’re the one leaving,” she says.